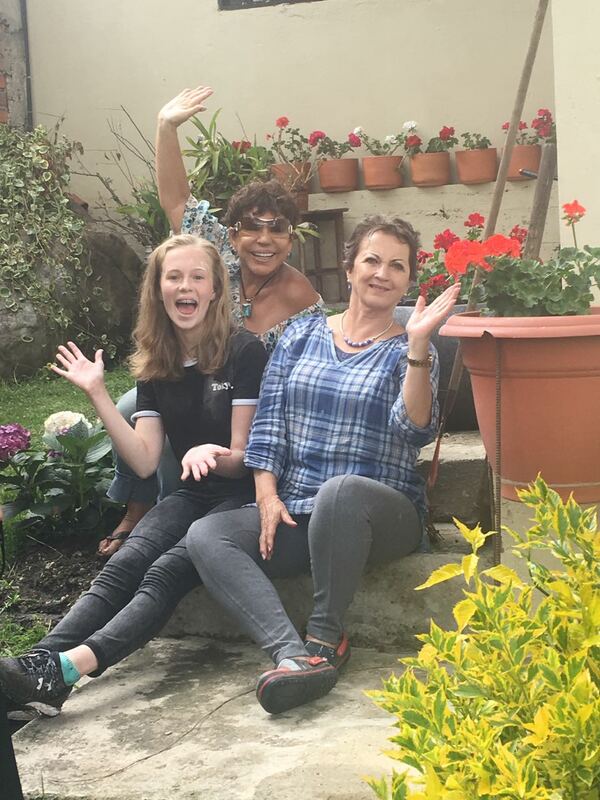 On Thursday 23rd February we arrived in Cuenca at 3.30pm after a 9 hour bus trip down from Quito. We were greeted by our host families and taken to our new homes. In my host family there is just myself and my two host parents as all 2 of their children are studying overseas and their daughter is currently in the UK with Lattitude. I have my own room to myself with a double bed and my house is rather lovely and super clean and tidy. 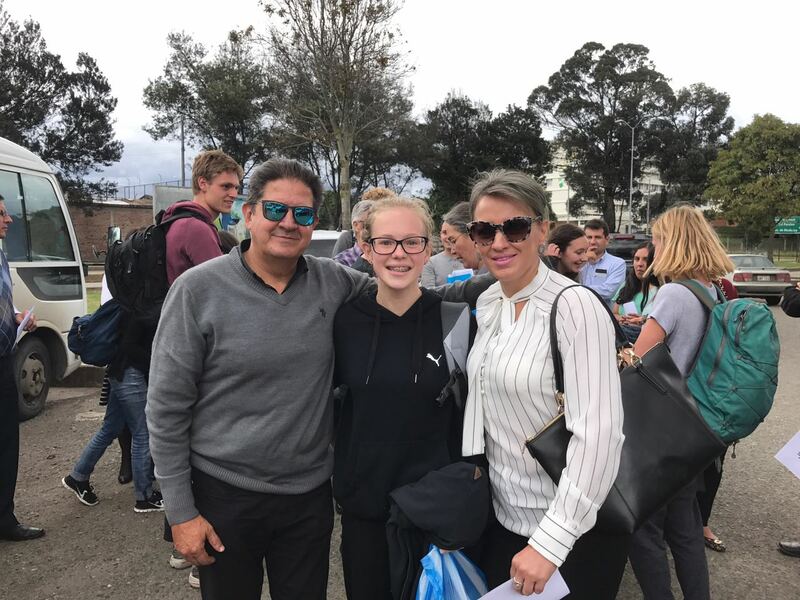 Below is a picture of me with my host parents. 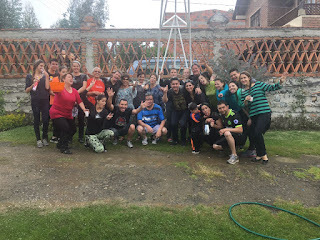 On Friday we went with the local Lattitude representative Kika and visited our volunteer placements (I'll do another blog post on everyday life and volunteering). 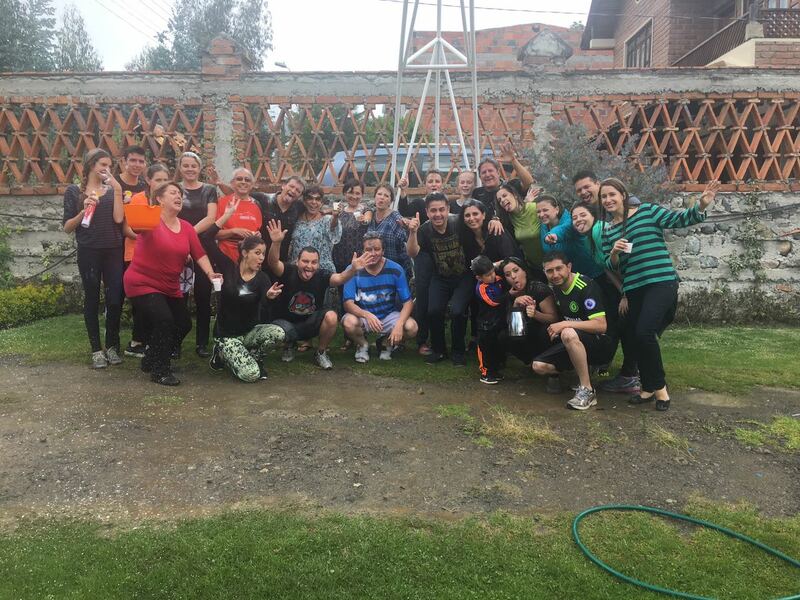 However, things were not as they would normally be when we visited the placements due to the beginning of Carnaval celebrations (a lot of foam and water to say the least). Today was the first day of full on Carnaval craziness!! Everyone's families had Carnaval plans and there was not a moment of rest or calmness in sight. My family left at about 10am and we picked up Abuela (grandma) and a visiting aunty from Manta and drove to one of the family member's house's. The house was in a slightly more rural location and the first thing that I saw when we arrived was a large truck from which they carried an entire (dead) pig with nothing but the hair removed, over to a marquee set up with a table for food (see photo below...). 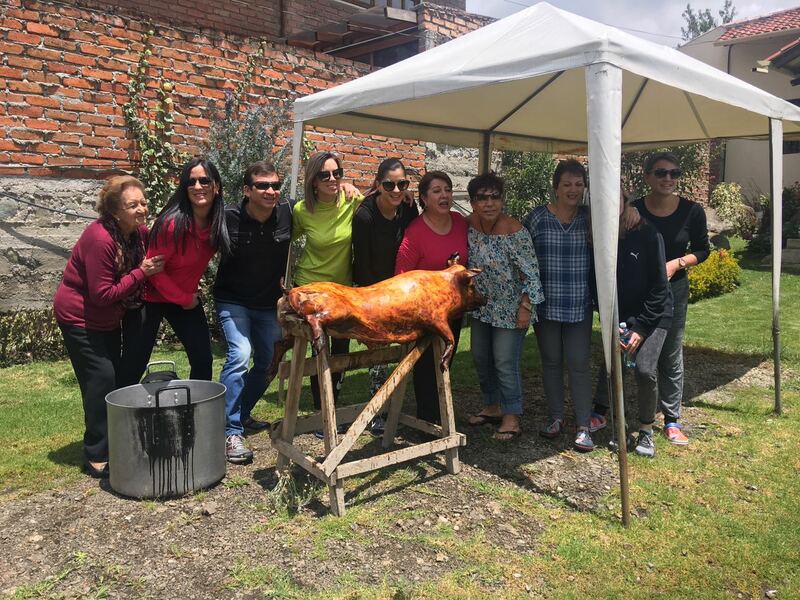 The entire family greeted me and everyone else with the traditional Ecuadorian kiss on the cheek and then they got stuck right in to eating the pig skin. It wasn't long after this that the hose and the foam came out. It is a tradition in Cuenca especially, to throw water at each other for Carnaval and there is certainly no one who is spared! I was drenched within half an hour of being there and meeting all these new people. It was rather overwhelming to say the least but definitely a lot of fun! Once the family had eaten all of the pig skin, the pig was cut up and put into a giant pot (seen in the picture) to be cooked up for lunch. We spent the next few hours being continually drenched with water and flour (which dries into your hair and doesn't come out for days) and foam and oats and trying to keep warm. Eventually when it was just too cold I got changed into some dry clothes and hung out with some of the cousins watching movies and staying inside. 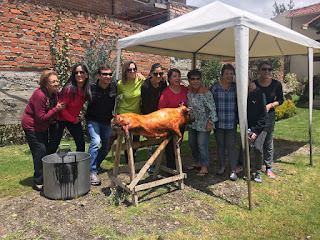 Eventually the pig was ready and we had a traditional Ecuadorian meal under the marquees setup outside - although I didn't eat much due to still recovering my stomach bug. Most of the men were incredibly drunk and there was a lot of music and dancing. Finally, around 9 or 10pm at night we headed home. I felt very shattered and overwhelmed but in hindsight it had been a fun day. This morning the family all came to the house and we all left at about 11am to head to another place called Yunguilla about 2 hours out of Ecuador for more Carnaval celebrations. I would say the house we went to was the equivalent of a Kiwi Batch just without the sea views and more mountain valley views. Thankfully today we didn't get too wet and it was my choice to join in the foam fight with the children there. We had Ceviche for lunch (more like a steak of fish marinated in a garlic-like coating) and spent most of the day inside avoiding the cold and mist outside. I played card games with the other girls there and it was just a nice chill day. In the late afternoon, Abuela made a delicious bread which she had also made the day before. Fresh out of the oven the bread was super delicious and had cheese in the middle. Eventually by about 10pm we left to head home. Again, I was incredibly tired but I was thankful the day wasn't so full on and really enjoyed becoming a part of my new family. The drive into and out of Yunguilla involved some steep and muddy dirt roads and also some interesting driving which can only be described as Ecuadorian. Once we'd had some fun and were soaking wet we danced to keep warm which I enjoyed. After a while they then decided to commence some other sort of tradition where they hit individuals with plants and dance around you whilst another person spits water at you... not entirely sure what this symbolised but it happened nevertheless. Most of the day and evening was spent dancing which I joined in on and thoroughly enjoyed and even got the family to accept me as one of them when I joined in on their dancing antics. Eventually by about 10pm our family decided to leave and we gave up the dancing and headed back home rather tired from the busy day. Thankfully on Tuesday we just had a chill day with no more crazy Carnaval celebrations and my family walked with me to each of my placements so I would know where I was going on Wednesday when I would start my placements. The three crazy days of Carnaval were a lot of fun but definitely full on and overwhelming and I struggled with homesickness a lot. I also miss having siblings weirdly enough as here with my family I am an only child. Guess it's things like this that make you appreciate what you have and as they say "Absence makes the heart grow fonder."